The container has the words "Get Well" and four balloons slightly raised in a 3-D look with a rainbow color affect....and it is made right here in Texas! It is filled with things for the patient and for sharing with loved ones! Pocket Size Crossword Puzzle or Word Find Book, box of Crackers, Gourmet Popcorn (Cranberry Walnut Crunch, Pecan Almond, Dark Chocolate with Sea Salt, or Caramel and Cheddar Jalapeno Crunch), Peanuts, yummy White Chocolate Amaretto filled Butter Wafer Cookie, Creamy Dark Chocolate filled Butter Wafer Cookie, (3) Individually Wrapped Tea Packets, Lemon or Assorted Fruit Hard Candies, and "Get Well" Snack Mix. The container, Popcorn, and Cookies are made right here in the Dallas area and the Peanuts are from Texas! Wrapped in crisp clear cellophane and topped off with a Handmade Bow. Includes a Handwritten Greeting Card. Approx. 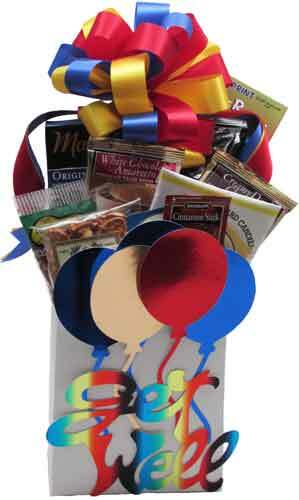 15"H x 7 1/2"W. Add Balloons for $2 each.